Epirus Nova (New Epirus) or Illyria Graeca or Illyris proper was a province of the Roman Empire established by Diocletian during his restructuring of provincial boundaries. Until then, the province belonged to the province of Macedonia; it later became a theme of the Byzantine Empire. Dyrrachium (or Epidamnus) was established as the capital of Epirus Nova. 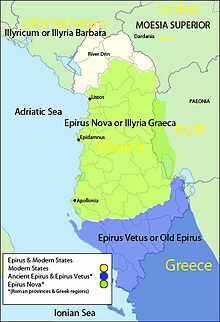 The region of Epirus Nova corresponded to a portion of Illyria that was then "partly Hellenic and partly Hellenized". The area was the line of division between the provinces of Illyricum and Macedonia and suffered from terrible earthquakes. The Ostrogoths, led by Theodoric, were stopped in Epirus Nova by Sabinianus Magnus. They entered in 479 and remained until 482.